JotForm’s Publish wizard has many options. Which one is best for you? This simple guide will help you find the right solution for your needs. 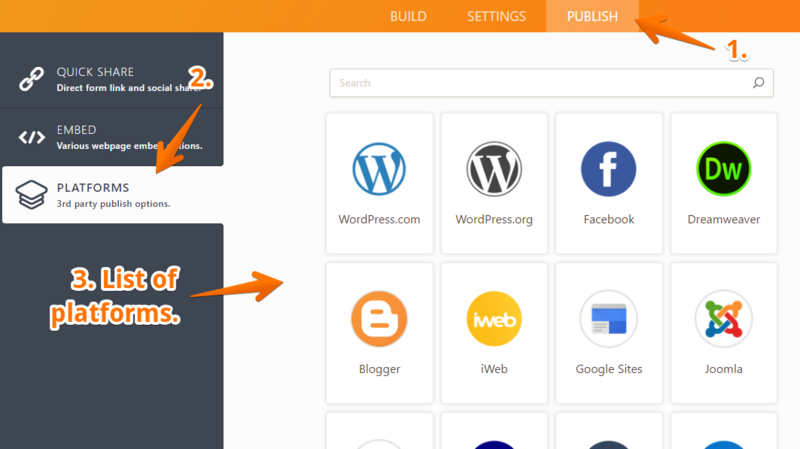 To access the publish wizard, click the PUBLISH tab at the top of the FORM BUILDER. iWeb, Dreamweaver, Wordpress, Facebook, FrontPage, Blogger, Tumblr, TypePad, LiveJournal, Expression Web Page, Google Sites, Xara, Yola, Webs.com, Memberkit, Drupal or Joomla. If you use one of these platforms, you should use the specific code provided for each of them. These are the tried and well-tested methods for those formats. 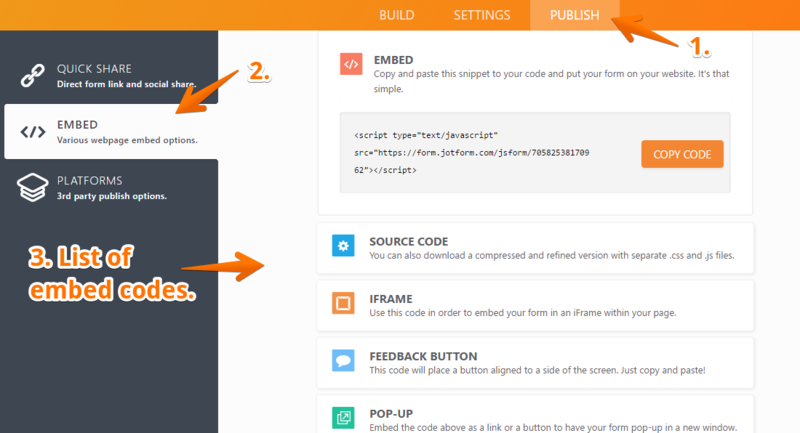 On the EMBED tab, you can see the available embed codes that you can use. 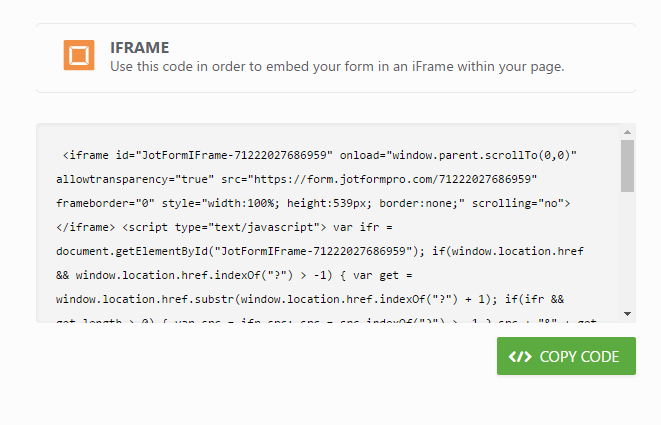 If you copy the iFrame code correctly, almost nothing can break the form on your page! Since the form is displayed inside an iFrame, it will not conflict with anything on your page. Any questions, comments, or concerns? Let us know in the comment field below! I have some jot form that are a template card of jot form I dlike to place thrm on a web page can you do that or will you send me a link! Cab jotform be used to take images from submitters via an email form, and have the images upload directly to a smugmug gallery? If it can, are you able to give some instruction how I might go about this. Regarding opt. 2, when you say : "You do not need to update the code on your website every time you change something in on your FORM BUILDER." What does that mean exactly? I need to change the reCAPTCHA version on my form. Don't I then need to remove the old form from my site and add the new one? I am trying to embed into a site page on Sharepoint using the iFrame code. It works fine on the Asset collection page, but when I attempt to insert it into the Site page, it accepts the code, but only displays a caption box. Please help. I am super frustrated. I tried to publish after creating the form but the could not, what shall I do? I am trying to use embed codes for displaying images on my website but they are not responsive when enlarging the page and making it smaller. I've tried adjusting the width to 100% in the code but the height never adjusts correctly. When I use the embed source code option for a jotform and paste it in mailchimp template builder the radio buttons and submit button dissappears and all thats left are the text. What could be the cause of this and how can I resolve this? tried embedding a form into site but it won't show the Submit Button to send email!!! Hi, I can't get my form to upload to Zenfolio. I have tried every type of code. Iframe seems to be the only one that works, but I don't get the theme and the form is very narrow. I use iframe and paste to my website, but when i view the form using my hp, (mobile), it did not display full form, no SUBMIT BUTTON . half form only. How? I am using iframe for my videos still i am not sure how can i make it loading faster? It often break up and take long time to load....p.s. i uploaded only HD 720p and 1020p videos. Can it be the size of the video reason for that or maybe is my browser? Your embed code will look similar to the example below. Tells FormSite where to find your form. I tried to put it on a page, but because we have https enabled on the site and the code comes from a http site, the form doesn't show. I've been using the embed code and its been working great until today and now nothing works. I'm using Volusion to build my site. 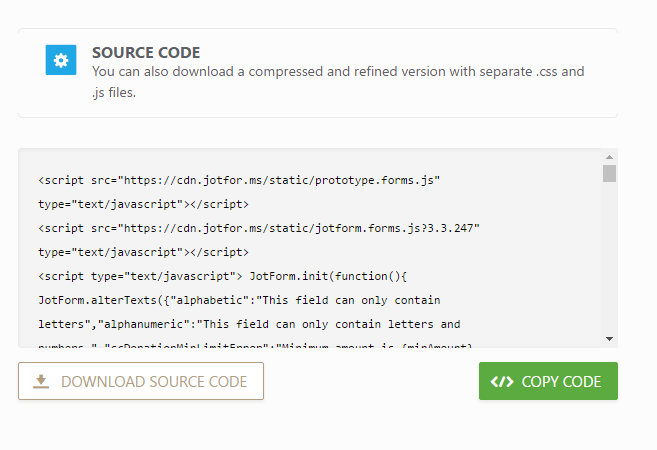 The source code is the only one that will show up but it looks awful and adds a bunch of stuff to the form. Why wont the embed code show up anymore?? the embed code doesnt work, nothing shows up. the iframe code doesnt work, shows blank space where the form should be. Godaddy will not display the signature box. Everything else if fine but the signature box is missing. Do I need to try something else? I have tried to embed my forms in my layout in Net Objects. I don't know exactly where to paste the code. The form shows up, but it is not in the right place. It is too high and encroaches on my navigation bar. The iframe doesn't work for me because I get script errors. I'm just a lay-person who has taught myself to use Net Objects and I cannot get their forms handler to work for me. I love the way the jotforms look. I am trying to embed a form with a link to click to open on my godaddy website. I have done this in the past, but I am not remembering the correct way. I cannot get a link to embed. Please help! What about if I am designing the website with adobe muse? Is it possible to have my form open in a new tab? I've embedded it into our website and it works great but others have asked if this would be possible. Thanks! Hi, I want to email my form to clients - can you tell me how to do this please? Thank you! This answered a question I had. Is there a way to set the height on multipage forms to adjust to the height of the form on that page? Looks pretty ugly when a page with a few field is displayed with a large scroll till the end of the page. I've tried embedding each of the codes in my Microsoft Word docx where I insert a hyperlink, and I get an error message "Cannot open the specified file". What am I doing wrong? I am trying to embed a form which includes a paypal payment. I am trying to emebd the form into an email created with benchmarkemail (http://www.benchmarkemail.com). The purpose is to send a reminder to clients whose membership has expired and I would like to embed the form directly into the email. I tried copying the source of the form into the html of the email and to use iframe. The form shows up ok in the body of the email (nicer with iframe) however when clicking submit from within the email it opens up a page (link is: http://submit.jotform.us/submit/30768659691168/) with the following error: "Form ID did not match. Form ID: Form Name: 30768659691168." Java (iframe) Platform runtime should be up-to-date, on every computer.